Mid-high level clouds will increase in advance of a storm system expected this weekend. No rainfall is expected during the day, with highs still warming well into the 70s. As surface high pressure exits the region to the east, south-southeast winds will increase to between 10-15 mph and possibly gusty west and to between 5-10 mph east. The storm system to the west will continue slowly approaching the region this evening. The increasing clouds and continued southerly breezes will hold low temperatures up in the 50s. A cap aloft should help hold off most of the activity until after midnight. 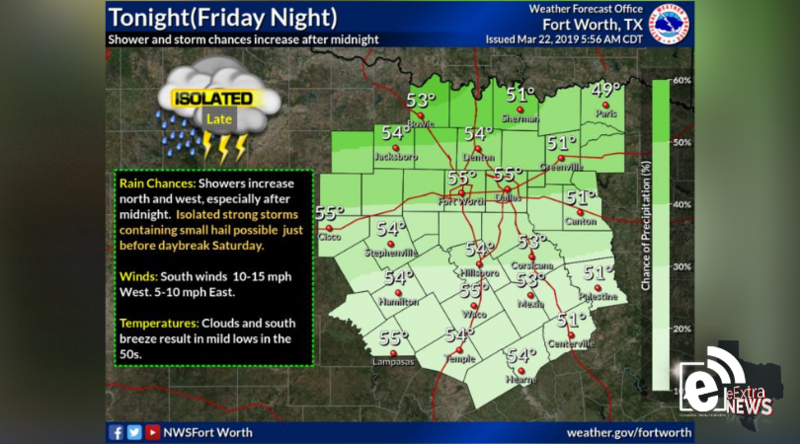 However, areas west of U.S. 281 from Jacksboro to Lampasas could see isolated showers and thunderstorms by late evening. Though severe weather is not expected, brief, stronger storms could produce small hail.